Join Student Union, Spectrum, and Anthony Aston Players for a fun-filled night celebrating Drag and Drag Culture. We will be hosting Onya Mann, Angelica Dust, Mrz. 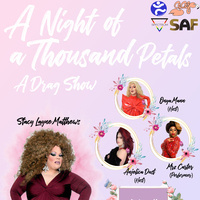 Carter, and Stacy Layne Matthews for a Drag performance! We hope to see you there!